Davidovich Bakery and its representative Marc Fintz appear to be key enablers, important contributors and eager vendors who have profited from the NY Bagel Scam for many years. They are also in the best position to help warn potential victims or debunk the fraudulent claims of Joe Smith and Dennis Mason – yet they continue to encourage individuals and families to invest their life savings in a scheme they must know will lead to financial devastation and loss. Perhaps its time for legitimate bagel retailers and restaurants to send a message to Marc Fintz and Davidovich Bakery that they don’t patronize those who profit from the exploitation of would-be small business owners. 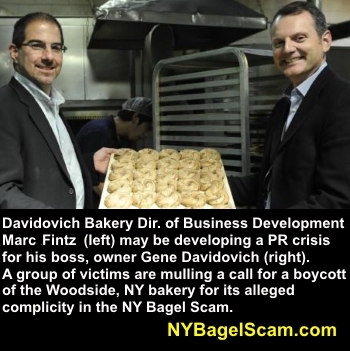 (NY Bagel Scam) NY Bagel Scam victims are considering a public appeal to boycott Woodside, NY-based Davidovich Bakery by delicatessans, diners, cafes, bagel shops, restaurants and foodservice operators nationwide. The purpose of the boycott would be in protest of Davidoch Bakery’s knowing support, both direct and indirect, of the Craig’s List NY Bagel franchise scam and its willingness to profit from the an illegal and predatory scheme. The NY Bagel Scam is a fraudulent franchise and business sales scheme run by Joe Smith and NJ-based franchise sales broker Dennis K. Mason. Both men have lengthy histories of franchise related lawsuits, enforcement actions, unpaid fines, and outstanding judgements related to defrauding would-be business owners. Joe Smith & Dennis Mason (at times using a variety of alias names) run ads on Craig’s List promising to provide a fully-financed bagel café franchise for an upfront fee ranging from $17,500 to $27,500 (currently $27,500). Those who pay the upfront fee and rely on NY Bagel’s promise of financing are then asked for high additional fees by shady vendors like Howard Fichman whose “financing” consists of $100,000+ spread across multiple high-interest credit cards. When the victims cannot afford the high fees or reject the usurious offer, Joe Smith refuses to return their upfront fees as promised. Those who have their own financing and manage to open a NY Bagel store stand to lose hundreds of thousands of dollars rather than just their upfront fees. That dozens of the NY Bagel Cafes have closed in recent years, and the odds are that they will too. Marc Fintz and Davidovich Bakery supply the par-baked bagels to NY Bagel Café stores. The fact that they use real NY Bagels is a key point in selling the franchise, and many claim that Joe Smith represents that their bagels are proprietary and made in a company-owned bakery. Davidovich apparently does not correct his public and private representations that the bagels they sell are proprietary and not sold by anyone else. The truth is, the same bagels are available to anyone for purchase online, and are sold in restaurants and delis across the country. Not only does Davidovich Bakery support the NY Bagel Scam by allowing them to misrepresent the source and exclusivity of their core product, Marc Fintz actively encouraged a prospective franchisee to sink his family’s life savings into the NY Bagel scam by assuring him the company is trustworthy and the concept is safe. Hello, my name is [withheld by request], and my family members and I are doing due diligence and researching the NY Bagel Cafe franchise opportunity. We were given your name and Davidovich Bakery as a supplier with whom we will likely be working. Would you mind sharing your experience with and opinion of NY Bagel Cafe & Deli and its franchisees? Can you tell me how long you’ve been associated with NY Bagel and how many franchisees you’ve supported? Do you find NY Bagel to be a fair, good, or great company to deal with? Are they honest? Dependable? Timely payers? How about the NYB franchisees you have worked with? Do they seem pleased with the franchisor and the franchise process? Lastly: From what you’ve seen, would you recommend the NY Bagel Cafe franchise opportunity to a close friend or family member? Thank you so much. I very much look forward to possibly working with you soon! Marc Fintz and Davidovich Bakery would be intimately familiar with the high failure rate of the NY Bagel scam failure rate since they supply the bagels to the stores. It seems highly unlikely that a key bagel industry player like Marc would not have caught wind of the franchisee bankruptcies, the lawsuits and governmental actions against Joe Smith, and the likelihood that this victim would wind up in financial devastation like so many others. These are all great questions. I think research is important. I also think that you need to keep in mind that matter how good a company is- without hard work and good customer service no business has a chance at success today. Additionally, be sure to research the location where you are opening to insure it is good for this type of establishment. That being said- we have experienced a strong relationship with NY Bagel Cafe for the last 4+ years. We have had strong relationships with over a dozen franchisees/licensees and they have never expressed any regret over being involved with the brand. There were several locations that closed but I am unaware of the reasons for the closings. I find Joe Smith to be an honest and honorable person and I think he tries to help his stores succeed. I don’t work directly on openings or the operations but this is my impression from his involvement whenever there are issues that he can help in. If I had a family member looking for a Franchise I would trust them with Joe but I think for yourself you need to understand the operation, the location, and the financial aspects of the business for it to succeed. I hope this was helpful and good luck. Is the revenue you receive by promoting and being associated with Joe Smith and the NY Bagel Café franchise scam really worth risking the longstanding Davidovich Bakery reputation? Are the owners, investors and members of upper management aware that Marc is promoting the NY Bagel Scam on the company’s behalf? Do they also stand by and endorse Joe Smith and his dubious franchise scheme? Do you think that your customer base of small business owners and bagel sellers would approve of your support of a competitor’s scheme to defraud small business owners and potential bagel sellers? What message would you like to share with customers who are disturbed to learn that you are at best enabling and profiting from and, at worst, complicit in a Craig’s List scheme that has been investigated and found fraudulent by at least two state Attorney Generals offices? Is it really in Davidovich Bakery’s best interest to encourage would-be bagel shop owners to go a route with an 85%-90% failure rate instead of opening their own shops and buying from you for years to come? In other words, wouldn’t you actually make more money if you spoke the TRUTH about the fraudulent NY Bagel Scam, stopped doing business with them and publicized the option of your own license program that provides advice on opening a shop with no upfront fees? How do you sleep at night knowing that you have encouraged this person and maybe others to invest their family’s future in the NY Bagel Scam… just so you could get a commission on a few bagel orders before they likely close… like the others. NOTE TO MARC FINTZ, DAVIDOVICH BAKERY & NY BAGEL CAFE: We invite you to provide any corrections, clarifications, rebuttals or opinions to the content of this post through a comment below and/or an email message to us at NYBagelFranchiseScam[at]Gmail.Com. We will be happy to correct any factual errors and publish any rebuttals or opinions. ARE YOU FAMILIAR WITH DAVIDOVICH BAKERY, MARC FINTZ, NY BAGEL CAFÉ, JOE SMITH & DENNIS MASON? PLEASE SHARE A COMMENT OR SEND US AN EMAIL. “While we are always happy to discuss real concerns your approach will definitely earn you a slander and libel lawsuit with acclaim for Treble damages. You never even spoke to me and I am forwarding this to our legal representative as we speak. “As for our relationship with any party. We sell bagels. Nothing more or less. The end customer takes the product and pays for it. What does that have to do with any alleged wrongdoing by NY Bagel. We have many locations that have been in the chain for years. They are our customers. “Ask any NY Bagel store if we didn’t assist them and extend them credit where needed. They place the orders not the parent company and we deal with them direct. “How dare you attack our good name with you scurrilous accusations without ever even speaking to us. “I expect a full retraction or I will personally seek intentional tortious interference with business operations, libel, harassment, and any other cause of action I can muster. “Both your threats and your advice to “get facts straight” might hold a little bit more weight if you weren’t simply throwing around legal terms that you don’t understand. “a slander and libel lawsuit with acclaim for Treble damages” is just embarrassing . “FYI slander = spoken defamation libel = written defamation. “As your legal counsel can explain, true statements are not defamatory. We never wrote that we spoke to you. We have a confirmed copy of an email exchange between you and a prospective franchise owner that occurred last August, 2016. The man contacted you because he was considering investing his family’s life savings and wanted to make sure that the company was legitimate and honest. You gave Joe Smith & NY Bagel Cafe franchise a hearty endorsement and said you’d do the same with a close friend or family member. “As there is nothing false about what we’ve published, you have no legal argument. It is neither libel nor slander. However, we will be happy to publish your rebuttal or clarification as you would like. Are you denying that you wrote and sent the message we quoted? (We can provide the email metadata if you wish). Do you stand by your endorsement of Joe Smith and the NY Bagel franchise opportunity now that your words are public? Or have you reconsidered your willingness to recommend the NY Bagel opportunity to friends and family since you sent that message last August? “FYI Opinions are also not defamatory. In America, we have the legal right to express our opinion and you have the right to express yours back. We can’t sue each other (at least successfully) because someone says something that displeases us. “We are graciously giving you the opportunity to share your side of the story and stand by or refute your email to the man who trusted your endorsement. “We are also granting Davidovich Bakery the same invitation to clarify whether your endorsement of Joe Smith and the NY Bagel franchise is shared officially by the company. “Hopefully you’ll be able to regain your composure, man up and communicate candidly and with a measure of accountability. Perhaps your many small business customers will applaud you for standing by one of your customers despite the many closed NYB accounts you must have in your system. Maybe they won’t. “The truth is, Marc, there are many, many victims involved in this issue. However, neither you nor Davidovich Bakery are among them.